​Microphase introduced minuscule monitors (SAT) in the mid 80s and had quite a following in France, Belgium, Germany and Scandinavia. Later on, passive stereo subwoofers, triphonic systems and all active versions of these speakers were introduced to further acclaim. They were designed to be not only very high quality speakers, but also to capture the interest of interior designers and female clients. They were objects of beauty as well as a melomane dream come true in a tiny package (200x200x150mm). 30 years later, Microphase Audio Design introduces a modernised version of these monitors, aptly named SAT MK2, with vastly improved performance, but still retaining the spirit and the look of the original concept. This is a limited edition of a beautiful object reproducing music in all its splendor. These speakers are designed for the melomane and the aestetician who don't want their hifi system to dominate their living room. They will also appeal to the pro market as perfect recording studio monitors, as they are very revealing of all the details and nuances of the music. From a very young age, Jean-Marie LIERE, the designer of these speakers, has been exposed to live music, as his maternal grandmother and mum both used to play the piano, then later on at jazz clubs in Paris (Memphis Slim at Les Trois Mailletz comes to mind...), various concert halls in Europe (Concertgebouw in Amsterdam, Musikverein in Vienna...) and the Sydney Opera House bien súr! In 1970, Jean-Marie started to learn electronics at Uni and attending hifi shows and visiting top dealers in Paris like Télé Radio Commercial near the Saint-Lazare station. Interestingly enough, all the music instruments dealers were and still are in that street. Jean-Marie was lucky enough to meet such luminaries as Joseph Léon (Elipson), André Charlin, Pierre Clément, Georges Cabasse, Jacques Mahul of Focal fame, just to name a few. These new monitors will be a limited series of a 100 pairs sold online worldwide. We are setting up a number of listening rooms around the World, the first one, if you live in Europe, is chez Point Musiques in the northern countryside of Paris, near Beauvais. Give Jean-Jacques Capello a call for a listening session, it is free! If you are in Australia or New Zealand, contact us and we will organise a listen in Sydney. We are looking for a listening room in Melbourne and hopefully this will be up and running before the end of 2018. Next places will be Japan, then the US of A. Stay tuned! We have been lucky enough to work with Brad Serhan, one of the most talented Australian designers of small speakers, on an upgrade of our crossovers over the last couple of months. We are very grateful for him giving up some of his precious time to help us getting these speakers to yet another level of performance, and in the process reduce their cost, which will then flow onto the final price to be published shortly. We also have new measurements below which clearly reflect the utmost performance of these tiny speakers,. Of particular importance, note the linearity of the phase response, a crucial element of the accurate reproduction of instruments' timbres. ​We are currently working on a central active subwoofer and then two separate passive subs which will act as stands for the SATs MK2. Eventually, we will release a central channel and rear speakers if you are keen to expand your system to a high quality home theater surround system. ​We are aiming to have these products all finalised and ready to demonstrate at the StereoNet show in Melbourne, Australia in October 2018. This project started as a private experiment. We were building a set of crossovers with the best components we had in stock for our own reference system. We were not expecting a significant difference with our current production speakers. However, the minute we turned them on, it became obvious that we had achieved another level of performance, with better bass, cleaner midrange and somehow a tad better slew rate. We are using foil coils in the bass section and Mundorf caps all throughout the crossover, hence the huge different in cost, including more labor to fit these bigger components inside the very limited space available inside the cabinet, without compromising the bass extension. After discussions with our best mates in the industry and our dealers in Paris, it was decided to put this improved version as a Signature model. Our cost is significantly higher than our standard model which has been optimised for best value and production cost. We have not passed on the totality of these costs on and are now offering the SAT MK2 Signature for 50% more than the standard model. Eventually, we will provide a kit of upgrade, so one can buy the standard model today and when more funds become available, you will be able to trade-in your original crossovers for the Signature version. We don't expect a significant difference in measurements, but will endeavour to check this later in 2018, when our testing facility reopens. 3-way monitor, with bi-wiring and time aligned tweeter in a marine grade birch plywood cabinet with a clear polyurethane finish. The main full range driver has a paper membrane and phase plug specially designed for this speaker by AUDAX in France. The other drivers are special purpose, sourced from Tymphany and designed by VIFA and PEERLESS. These new passive subwoofers also act as stands for our SAT MK2 and SAT MK2 Signature. They come as standard SWS MK2 or as SWS MK2 Signature with the upgraded crossover components found in the SAT MK2 Signature. In their standard version, they are priced the same as the SATs. Again they attract a 30% surcharge for the Signature version, rather than 50% as the crossover is a lot simpler than in the SATs. Please note that the SATs are not filtered at the lower frequencies to retain their transparency. 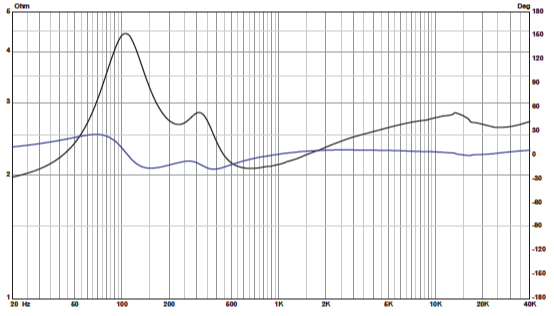 The crossover is a 12dB/octave at 150 Hz feeding a proprietary 21cm driver from Audax France. The plinth ensures stability to the whole unit and create a stable and consistent surface to the bottom mounted driver. The proximity of the plinth surface and the driver have other benefits and contributes to the linearity of the response from 40 Hz to 150 HZ +/- 3dB. Viscoelastic pads from Les Davis Audio are fitted between the subwoofer and the satellite for perfect isolation of the two cabinets. We will eventually have a powered version of this product. Stay tuned! The newest addition to the Microphase Audio Design family is a close replica of our original SAT introduced in 1984. A 2-way, bass reflex, true bookshelf speaker, the SAT MK1 is only 10mm bigger than the original to accomodate the newer chassis of our bespoke Audax main driver. A new high performance Audax tweeter replaces the very popular TW10 we used at the time. Performance is surprising for the size and the price. A better connector is used as well to accomodate high performance speaker cables. A Class D, 2 channel with active crossover amplifier can be fitted on request on the back panel for professional applications or as surround channels for a home theatre. 2-way monitor, time aligned tweeter in a marine grade birch plywood cabinet with a clear polyurethane finish. The main full range driver has a paper membrane and phase plug specially designed by AUDAX in France. The tweeter is also a bespoke speaker from Audax. We had our first Australian public presentation at the International Hifi Show in Melbourne last weekend 12-14 October at the Pullman Mercure Hotel Albert Park. In its third year this show organised by StereoNet and Marc Rushton was a great success driving almost 400 visitors to our small room. See some of the comments from visitors and journalists alike in our Testimonials section below. "Gobsmacking that these little speakers could hold their own in a very big room. Truely impressive. Big sound & imaging can come from beautiful and small little boxes. This was fun and rewarding!" "Au delà des caractéristiques et des techniques mises en œuvre pour aboutir à ce résultat musical surprenant de vérité, ces enceintes avec des dimensions et un espace « ridiculement réduit » proposent de très hautes performances musicales et se comportent comme de « très grandes ». "Besides the specifications and the technolgies implemented to achieve this surprising musical result, these speakers with their ridiculously small dimensions offer outstanding musical reproduction performance and sound like much bigger ones"
Jean-Jacques Capello - Point Musiques. Some things that are not quite what I’m used to. This are my biases so purely subjective and meant as constructive comments.
. I’m used to a somewhat softer top end. I found the speakers very sibilant compared to what I’m used to and what I consider neutral. Both versions, but the Signature less so. · This in my opinion, affected the tonal qualities towards a “toppy” sound that is, to me, less natural and not as I hear live unamplified instruments. · It would seem from my observations above that the upper mids and highs are somewhat forward and the lower mids shelved down. "There is a lot to like about both the Microphase SAT MK2 and the recently completed Signature version. They both benefit from a relatively small size which assists with soundstage projection. While unconventional, the 3-way design with the bass driver located at the back of each cabinet combined with careful driver selection has delivered a very musical speaker which easily extract the emotion of a recording in a very satisfying way. For a full range experience a subwoofer works well with the SAT MK2s to deliver the bottom octaves, however they can still hold their own in smaller rooms with carful placement. The Microphase SAT MK2 Signature version builds on what is already a very competent design to deliver further refinement by tightening up the presentation, this tightening delivers a lowering of the noise floor allowing for an increased perceived transparency. - Diminutive in size but not in presence. Attack, clarity and micro-detail is very excellent, all without feeling clinical, dry or fatiguing. - Bright, but in a good way; cymbals ring and decay very realistically, and instruments like saxophones bark with their inherent rawness that's heard on-stage but not from the cheap seats. - Coupled and blended properly with a conservative sub yields a very natural sound, lacking any sense of artificial bloat that some speakers exhibit; in fact, I initially found myself waiting for them to 'jump' out at me, only to realise after a while that I had been anticipating (in vain) for the 'inevitable' hotspots to reveal themselves. The top-end, in particular, I found to be brilliant; yes, it's there in spades, but is exceedingly natural. I didn't find myself hearing the tweeter, which Jean-Marie accredited to the speakers' linear phase response and therefore detail (that he's particularly proud of). After a while, I was only hearing the music, not a well-transduced version of it. - Small size, slight breakaway from the standard box shape (with the large chamfered edges) and interesting looks means less chance of upsetting the spouse. - The small driver size won't give you access to the upper limits of dynamic range and SPL without some degree of driver compression, but these are about finesse and detail, not shock and awe (although are certainly not incapable of generating decent SPL's in the kind of room they're designed for). - As always, poor quality recordings are quickly shown for what they are (but high quality versions absolutely shine). - I didn't get to hear them without low end augmentation, but I'd imagine it's largely essential for the full experience. As an audiophile and an architecture student, I’m firstly very sensitive to the sound quality but also to the design. And I admit that the first time I saw the SAT MK2, they completely catched both my eyes and ears. The sounds is really impressive, precise and clear, amazingly considering the super small size. I find the design simple and minimalist, just going straight to the point. Sure they will make my perfect next loudspeakers ! ​ Arthur from The Sydney Audio Club I was quite amazed at the quality of the tweeters in these small speakers! One of the sweetest high frequency drivers I have heard in many years. ... or perhaps, it's Jean - Marie's magic touch that made them sound so good? These are highly specialized transducers, targeting (as we were told), the smallish Parisian apartment environment where, I am sure, will sound even better from the excellent sounds we heard on Sunday.One has to consider the fact, these little 'gems' did their magic without the help of any special multi $$$$$ cabling or power line conditioners etc etc.My final thoughts were, Jean - Marie presented an 'honest' product - what you see is what you get - that communicated very well with the listeners an made music thoroughly an enjoyable event! Jean - Marie should be proud of his creation! Where can I listen to these minuscule ultra performance speakers?